The Fitt Factory @The Spool Factory, May 12th. For more details, please contact Lucy on 0896038531. Una Bhan were absolutely delighted to welcome Tour Operators from all over Europe, Canada & America to Boyle as part of their Familiarisation Tour of the region organised by Failte Ireland. These opportunities to promote the region to international markets are highlighting how the Irelands Hidden Heartlands initiative is really going to invigorate Tourism in the midlands of Ireland. There has been widespread welcome for the announcement of €148,225 funding for projects in Boyle Courthouse. Senator Frank Feighan has warmly welcomed the LEADER funding allocation to restore Boyle Courthouse to house Boyle Model Railway and for community activities. Boyletoday.com reports that a number of buildings in and around Boyle have been approved for funding under the Historic Structures Fund and the Built Heritage Investment Scheme. The buildings include: The Harrington Studio in the grounds of King House is to receive €15,000, Kingston Hall stable building, Rockingham is to receive €4,000, St Patrick’s Church Crossna is to receive €4,500, Workmans Cottage, Erronagh, Knockvicar, Boyle is to receive €4,000, The Gatehouse, Croghan, Boyle is to receive €3,000, Stable Yard Wall, Moylurg House, Cloger, Boyle is to receive €2,500. The funding was announced by Minister for Culture, Heritage, and the Gaeltacht, Josepha Madigan TD and covers 478 heritage projects across every county in the country who will benefit from a combined €4.3m. Boyle households will be asked to help with a survey of energy use in Boyle. The results will be presented to Boyle next month. The intention is that anyone in Boyle interested in energy or climate will get together to follow up on energy ideas for Boyle. Good Energies Alliance is a voluntary community group based in Leitrim active in community energy issues and is seeking your help with this survey in Boyle. Please contact Liam Breslin on 0872578392 for further information. 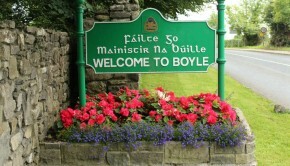 A report on Boyletoday.com on Thursday details a Boyle native who has recently been crowned a World Champion. John McDermott, who now lives in Sligo and is originally from Abbeytown in Boyle, won gold in the 400m 75 age group World Master Athletic Championship in Torun, Poland recently. John put in an impressive time of 1:07:28.